It all started when we began watching evening show Hindi movies at a nearby cinema hall. The movie would start right at our usual dinner time and we hated rushing through dinner. For the love of movies and the half-off tickets on tuesdays (I know! ), I started to pack portable food for our ‘theatre dinner’ – obviously something dry, something of a wrap and wholesome too. Dry Subzis rolled into chapatis became our default ‘theatre menu’. Every time we had a movie date, the menu was also almost set and we began looking forward to a ‘theatre picnic’ of sorts. As it happened, carrots were the only vegetable in the refrigerator that day and so began the saga of this carrot stir fry. Trial and error and many moons later, the recipe I have today has come to be a staple and now I make it intentionally and not just because I have no other vegetable in my crisper. Don’t know if I mentioned this earlier, but I have an unsaid affinity for bitter sweet ingredients. And, lately, my fondness for Kasoori methi – a dried form of the methi or fenugreek leaves has increased leaps and bounds. I catch myself adding it to whatever I can pull it off with. Kasoori Methi is used more of as a herb whereas the mainstream Methi leaves find uses more as a vegetable. Kasoori methi can be substituted with fresh methi leaves in this recipe. However, unlike other dried herbs, you might find that Kasoori methi has a deeper flavor than it’s fresh counterpart. Sesame seeds are quite often forgotten in everyday cooking in spite of their good qualities. a renewed resolve to use it more often is also a reason why I added them to this recipe. They are taste enhancers too nonetheless. 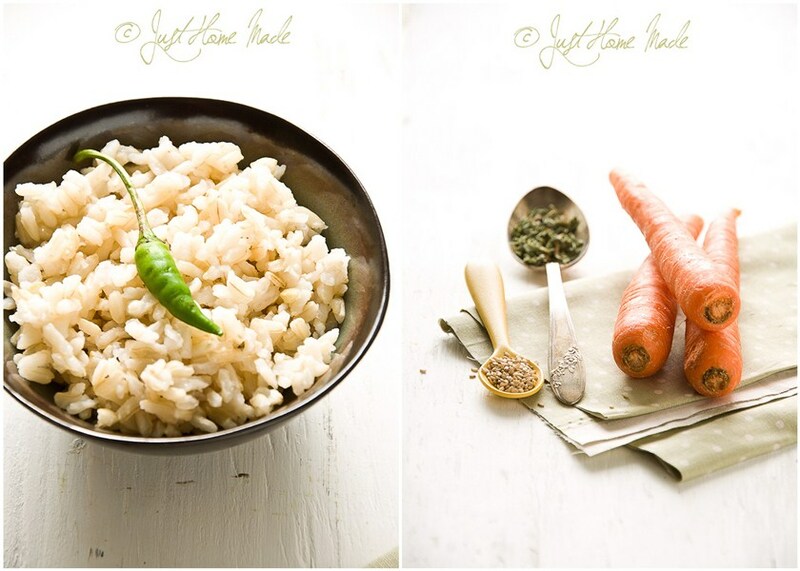 Sesame seeds and Kasoori methi balance out the sweetness of the carrots with their earthy flavors. Just carrot subzi is too sweet for my taste, I’d be left craving for something hot right after dinner! Heat oil in a pan or kadai. When oil is hot enough, add cumin. Add turmeric and cumin powder after cumin starts to sizzle immediately followed by diced carrots. Sauté for a little while, add salt to taste and cook covered over medium heat stirring in between until soft. Add red chilli powder or a milder paprika and amchur to taste. Finish by sprinkling sesame seeds, squishing kasoori methi and give a good stir. Note: Amchur is dry mango powder. Substitute with lemon juice if you don’t mind a little wetness. Absolutely delicious!!! 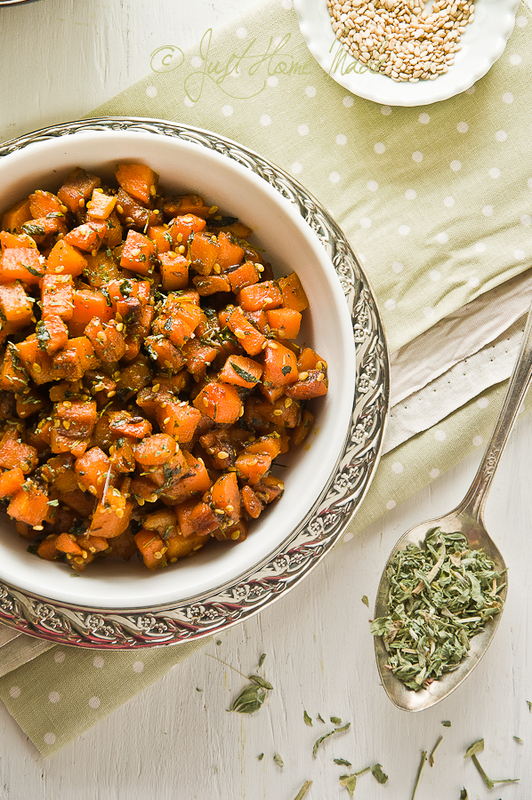 I love the use of kasuri methi with carrots, the bitterness must balance the sweetness so beautifully! And sesame seeds?? Brilliant! Love this dish and am gonna make me some for dinner tonight 🙂 Thanks for sharing the recipe! This sounds wonderful. 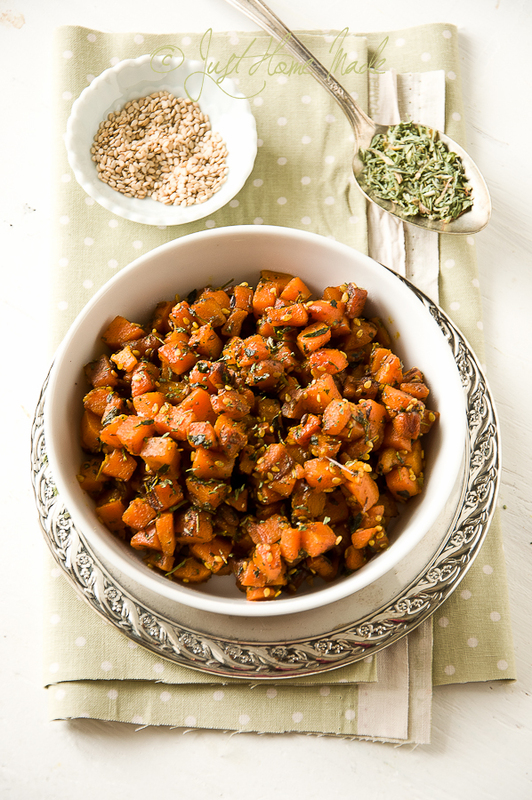 Love kaoori methi a lot and carrot fry is something we all like. Radhika..you have such an amazing talent for making a mundane vegetable like carrot look and sound so delicious! I’m eating so much carrots in season that might as well add this before it vanishes! Interesting! I am not a fan of plain carrot playas as it is too sweet to be eaten with rice. I am sure kasuri methi will change that a lot! Same here Chin! I would’ve been the last person eating a plain carrot palya..
love ur blog new look and a cool recipes 🙂 Cannot wait to try! great pics radhika. 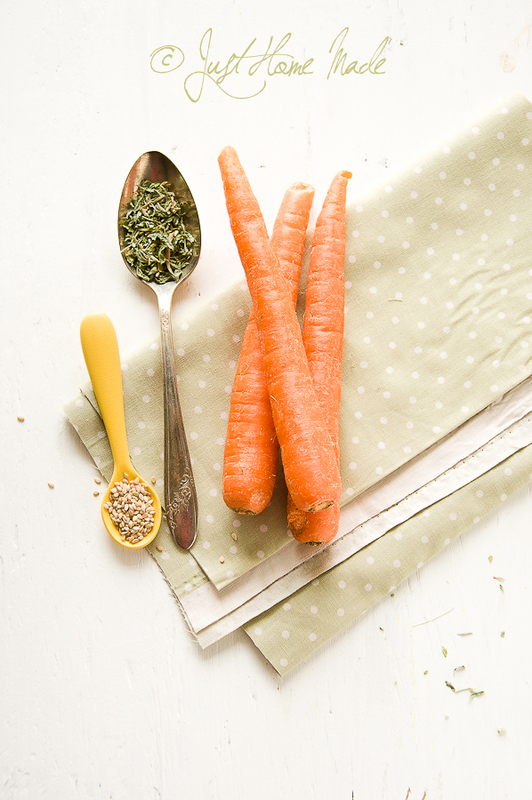 i am not so fond of plain carrots and usually club it with peas or peas & potatoes. yet i think adding kasuri methi and sesame seeds must be surely changing the sweet hint of the carrots. I am obsessed with methi. I can’t find it fresh, so I am growing my own this summer. I’ve been craving something cooked with the ton of carrots I have in my fridge for juicing, so I can’t wait to try this! That’s a beauty, Radhika! I love the use of amchoor, that is one of my favorite spices. I love the new design Radhika, and those photos are absolutely beautiful. I love carrots, in fact we have carrot fritters quite often, but I love the sound of your carrot stir fry. Your “movie picnics” sound like a lot of fun too. We normally rush dinner to head to a movie, but I really do like the idea of bringing something homemade to enjoy during the movie. Love the new design, dear 🙂 And those photos of carrots smothered in aromatic kasoori, spices and sesame seeds.. YUM indeed! Sounds so good, Radhika, but I used up all my carrots in Halwa Gajar 🙂 Great photos, by the way. Delicious looking curry,sounds so yummy n flavorful. sounds delicious – curry is so tasty! This post made me go back in time. Long back we had a cook who made someting similar. I can’t recall the addition of kasuri methi but I love it. I am a huge sucker for the aroma. Easy and beautiful recipe. I can imagine wrapping a nice phulka on it and biting! Lovely recipe! 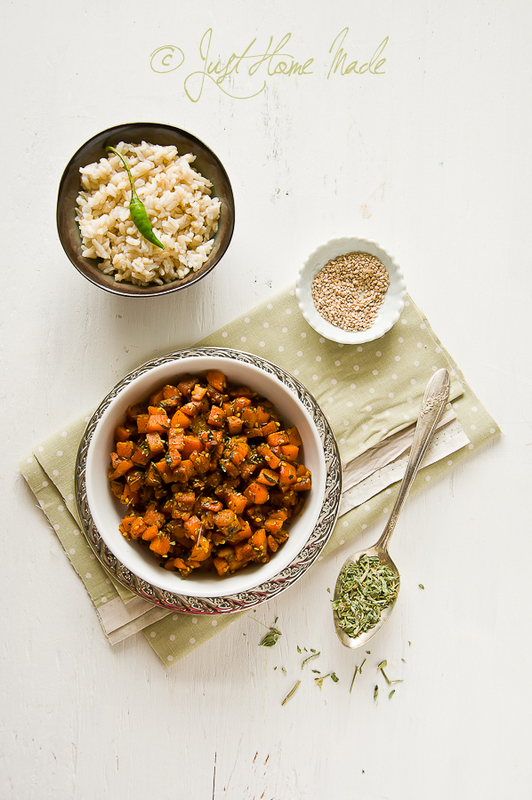 I love the flavor of Methi, I will have to try this wonderful recipe! Gorgeous Pics! I came across your blog yesterday and this recipe really appealed to me, so I made it today. It is delicious! I love it and I’m sure my hubby will too! So glad to hear that Nikhila! Thank you for stopping by to tell me that.. So I made a variation of this recipe, I added peas, carrot and potato this time with fresh methi leaves, The natural sweetness of vegetables was a great contrast to the natural bitterness of the methi leaves. came across this recipe when I was searching for recipes using kasoori methi. 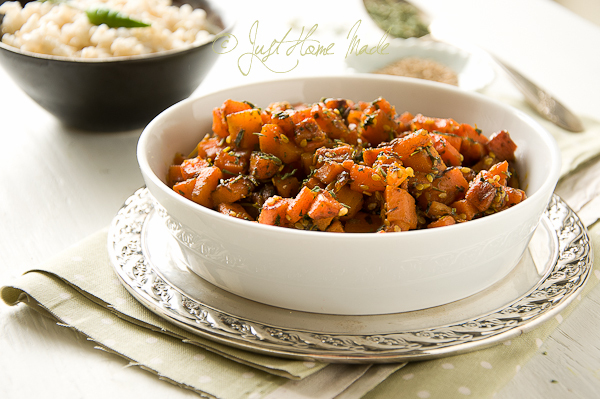 Tried it last night – was one of the best carrot dishes I have made! thanks for this!! I used lemon juice instead of amchoor, looking forward to trying with amchoor too.